What part of your platform do you think is the most important for an author to grow? Twitter seems to be the main player in regards to platform as of now. Do you see other social media platforms as having worth? Which ones and how do you find them useful? Which social media platforms do you use? How do you think they help you sell more books? How important is it to have an active website as an author? Is it significantly more beneficial than other forms of social media? Where should new writers go to find other, similarly-minded people to get their platform/community started? Should a writer try to build an author platform and audience if they are not-yet-published? What would be the most important things to include? How much time should you typically spend trying to grow your platform? I know having an author platform is necessary, but I’m scared its going to cut into what writing time I’m able to carve out for myself each day. Is it possible to grow your platform without most social media? If not, what kinds are the best to use? Do you feel that newsletters are a powerful tool and should more time be spent on them, they say on writing blog posts? Pre published writers, including myself, seem to build a platform of like-minded individuals, aka, other writers. Any tips for posting for and attracting a different type of audience, like book bloggers and simply readers who aren’t fully immersed in the world of writing social media as we are? Do you prefer updating a blog or sending newsletters? 1) How to get people to your website? 2) What part does marketing and promotion play? 3)How to find your brand and do you need one for your platform? What is the difference between having a newsletter or a blog? How do you grow your audience? Social media is a great place to grow your platform, but it comes with a lot of negatives (drama, bad energy, hot takes, etc.). What’s your best advice for navigating potentially treacherous waters while still growing a positive author brand online? What types of things should one post on social media? I have seen conflicting advice in this area. Some say focus primarily on your craft – the work and writing while excluding personal life. Others say that including your personal life makes you more relatable. And if you have children do you shield them from being on your social media or does that make you less authentic? I am building a solid community amongst other lit/pub/writing people on Facebook and Twitter. But how important is it/how do I as an aspiring author build a reader community? I don’t know if I can ask a second question but if allowed, if you’re writing YA and looking to get on to say, Instagram like you mentioned, how do you connect with young adults when you’re not a young adult yourself? If you were to start all over again, how would you build your platform? What would you do over again? What would you skip? What professional organizations help with promoting writers? You put a lot of emphasis on Instagram, but I’ve found it very difficult to engage with people on that platform versus Twitter, where it’s a lot easier to unintentionally find content that you don’t directly follow but would be interested in. For writers who aren’t published yet, how would you suggest growing an Instagram platform when they don’t have any book-related images yet of their own to post? Annie, thank you so much for taking the time to answer questions! I have one: what types of marketing and publicity have you found to be most effective with your own book? How do you manage getting good photos for Instagram and how important are the visual aspects for an author? Would commissioning art for your book be considered marketing and can it help grow your platform? Could you grow your author platform with both a personal account and a author-related or business account? If you want to change your brand? How should one transition that change? 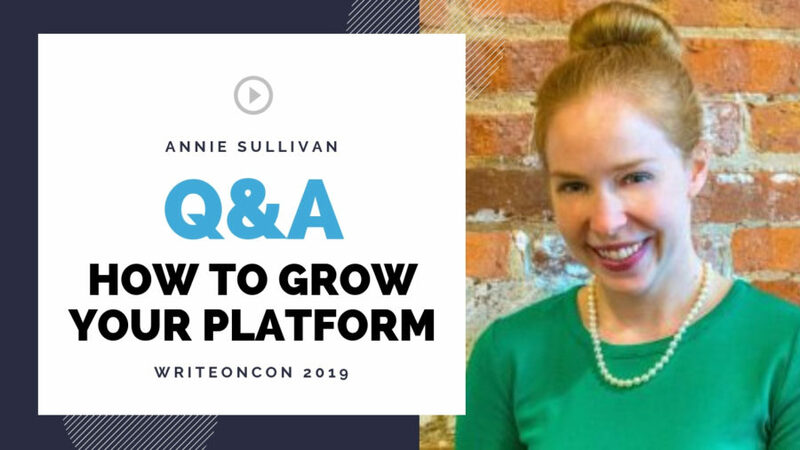 Thank you, Annie Sulliivan, for a great and informative talk about author platforms, and for answering my question. I’m going to start to work on my platform, even thought I’m not-yet-published. Your advice made sense and was very helpful. I’ll be following your social media and look forward to reading your books and hearing about your news. I feel like my twitter has stagnated and I’m not sure what I would blog about, since a lot of the topics I want to do (talking about my novel, progress, talking about things I like) are considered to be no. But I don’t want to turn into a ‘writing blog’ as I don’t feel like an expert. Help. Thank you for this video. I found plenty of info on why and how to use specific social media.